On the Council Grounds today stands an important artifact from the life of Mary Jemison, the famous Indian Captive. When she lived on the Gardeau Reservation in the present day Park, she and her daughters built a cluster of cabins. The cabin on the Council Grounds is one of these - it belonged to her daughter Nancy. 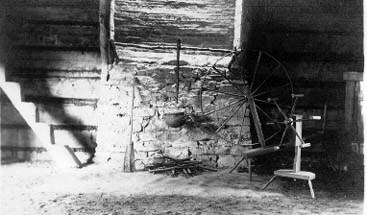 You will find below an image of the interior of the cabin taken around 1910. The description is from a 1907 Guide Book. "This old log home, which originally stood on the Gardeau Flats very near the home of Mary Jemison, is associated with her memory as having been built by her for the home of her second daughter, Nancy, who married John Green. It is a well-preserved example of the log house of the first quarter of the nineteenth century. The large open fireplace and chimney are made of sticks plastered with mud, and the stairs leading up to the loft are made by simply cutting notches or footholds in a sloping log. This log ladder was made by John Shanks, A Seneca Indian....The "White Woman" undoubtably spend much time in her daughter's home, and one artifact of its present furnishings is the old clock reel for reeling yarn, which belong to Mary Jemison herself and was used by her in her cabin on the Gardeau Flats....One of the most interesting relics in this old log house is the original door of the log cabin on the Gardeau Flats in which Mary Jemison lived...."